Unfortunately our investigation into placing signs on these major roads has been a dead-end due to the various right-of-ways established by the City of Edmonton. A new park sign was added to the Allard Rink site in December 2017. We payed to upgrade the sign to be a changeable letter sign. When a new park sign is added by the City of Edmonton we will pay to upgrade the sign to be a changeable letter sign. A big thank you to Gil Rueck for being so dedicated to having interpretive trail signs installed along the Blackmud Creek trail system! 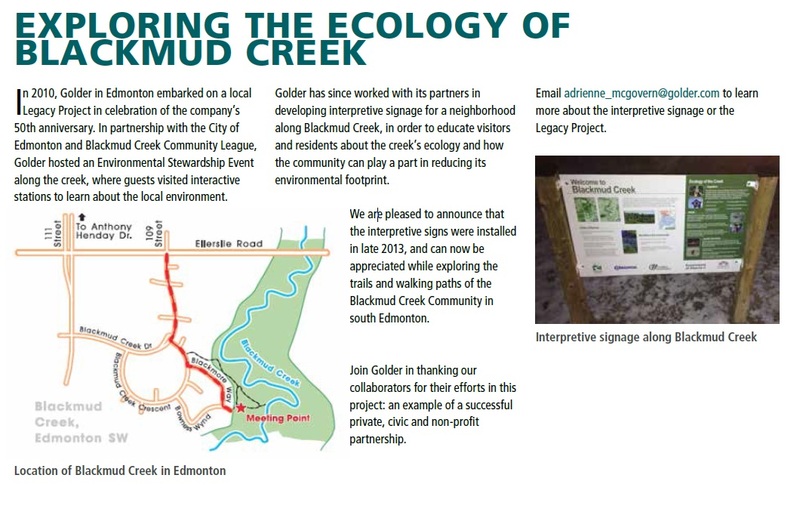 The project was done in partnership with the City of Edmonton, Golder Associates, and Columbia Awards. Click the link below for more details. Preliminary investigations are being carried out to determine the costs of other types of signage to help get the word out to the community about news and events. For example, we could install a message boards by stormwater management ponds.